Since Week 2 of the Preseason, the 2016 Raiders defense has been struggling with giving up big plays. Over the first 4 weeks, the high-flying offense has been able to keep barely a step ahead and lead the team to 3 victories. In week 5, the Big Plays once again haunted the defense, prompting the clearly concerned Head Coach Jack Del Rio to say that the Raiders’ defense was “playing Santa Claus”. Christmas in October sounds great, but on the playing field, a Defense that is gifting big plays to opposing offenses is more a cause for increased work than a holiday. Overall, the Raiders defense is moving forward and there are definitely parts of the defense that have improved significantly since Week 1, but those are being overshadowed by these explosive plays. If the defense gives up a 50 yard TD bomb on 3rd down, who remembers the great defensive plays on 1st and 2nd down? In looking at the Christmas Defense, we can see that there’s no single problem; there are little things that are manifesting in different ways and in different places. Here’s a close look at some of these details and some insight into what is causing the explosive plays. In the first four weeks, the defensive coverage was primarily Man-Free (man coverage with single free safety) and Cover 3 (3 deep zone coverage), similar to the Seattle Seahawks’ system. In Week 5, Ken Norton changed it up; he installed Quarter Coverage. Quarters Coverage (also called Cover 4) is a hybrid scheme that initially sets up as a 4-deep/3-under Zone defense but it has substantial Man principles involved. As with most schemes, it requires good coordination and minor variances can create big holes. But when executed well, it can provide some nice advantages. It is particularly demanding on the safeties. It forces quick decisions and sets them up in potential 1-on-1 man coverage assignments against slot receivers. 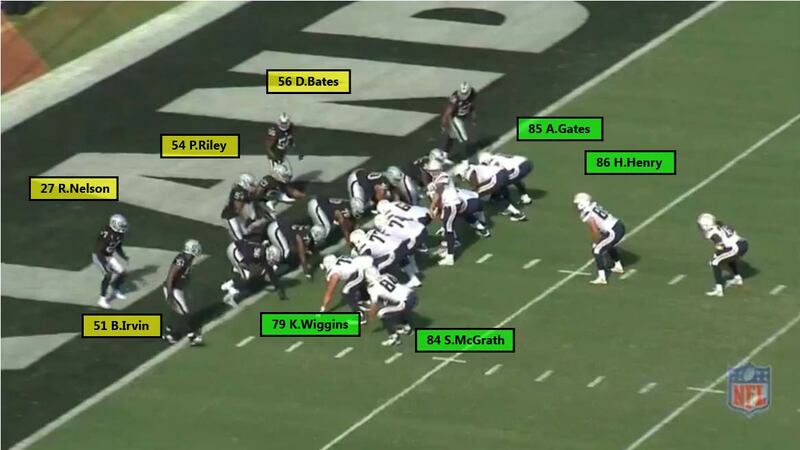 Here’s a look at how the Raiders ran Cover 4, how the safeties were playing it, and how Philip Rivers and the Chargers were attacking it. 2-16-SD 18 (2:00) (Shotgun) P.Rivers pass incomplete deep left to T.Benjamin (S.Smith). Outside speed receiver Travis “Rabbit” Benjamin (5’10”, 172lbs, 4.36s 40 yard) run a deep post against RCB Sean Smith. Sean Smith keeps up with Benjamin and Rivers’ pass falls incomplete. The first reaction may be “Where’s the safety help?” When you look closely at the play, you’ll notice that if Benjamin does beat Smith and gets the completion, there is no one between him and the endzone. This looks like a “Zero Coverage” which is almost always a result of an All Out Blitz. 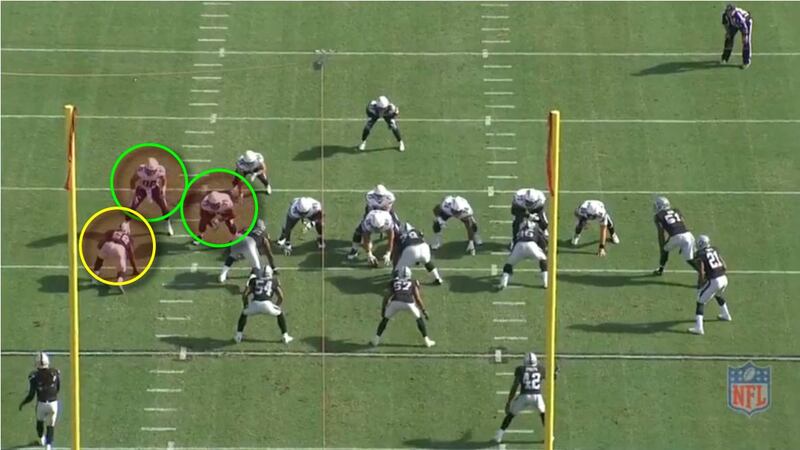 The Raiders do blitz, but they have 6 in coverage, so what happened? TE #85 Antonio Gates lined up slot left runs an out route at about 8 yard depth. Remember this route combination; it is important and will show up again. With both Reggie Nelson and Sean Smith on the right side, we would expect that the deep post would have in/out bracket coverage taking away the deep throw. But Gates’ route will affect Nelson and create an empty deep field. 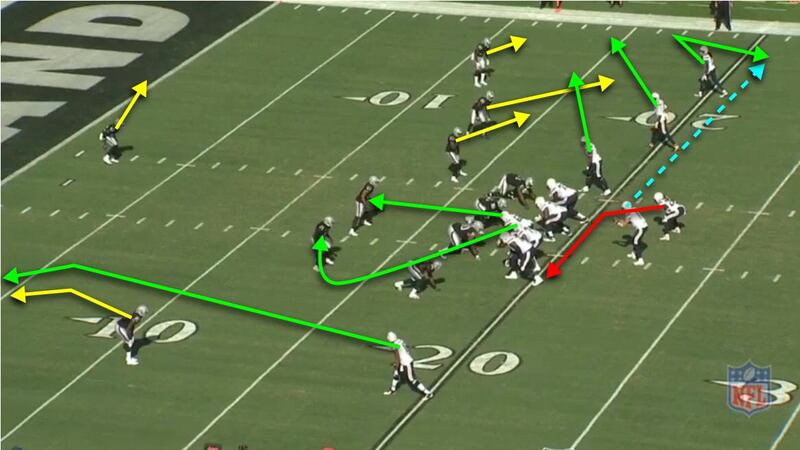 Bruce Irvin covers Gates on the intermediate out route. 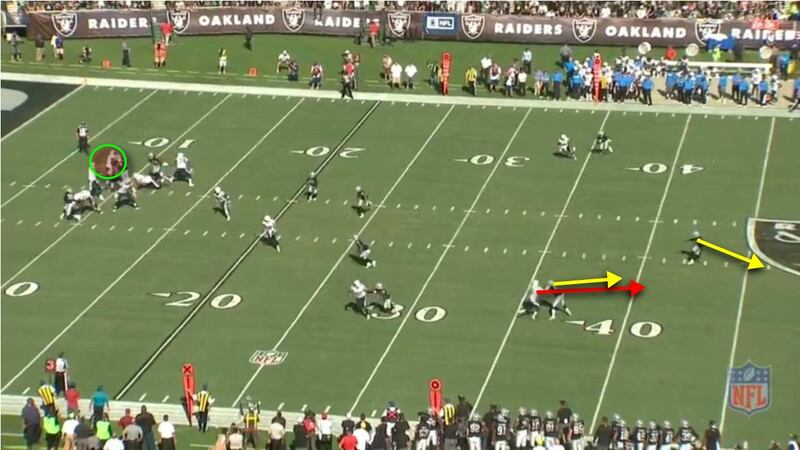 Sean Smith takes Benjamin on the deep route. It’s important for Nelson’s assessment to be in sync with both Sean Smith and Bruce Irvin. 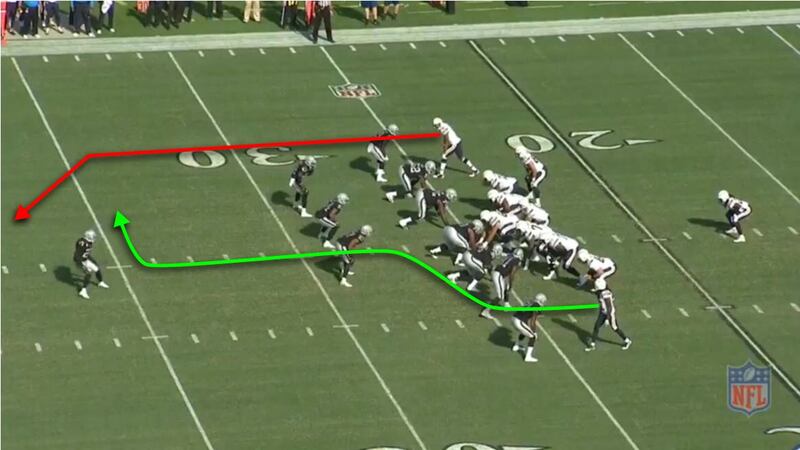 Each coverage defender has to know where Nelson is going to go, based on the routes. Benjamin is running the deep post route against Smith. Nelson is vacating his deep position to drop underneath. It appears that he has judged Gates to be running a deep corner route and is protecting against that. 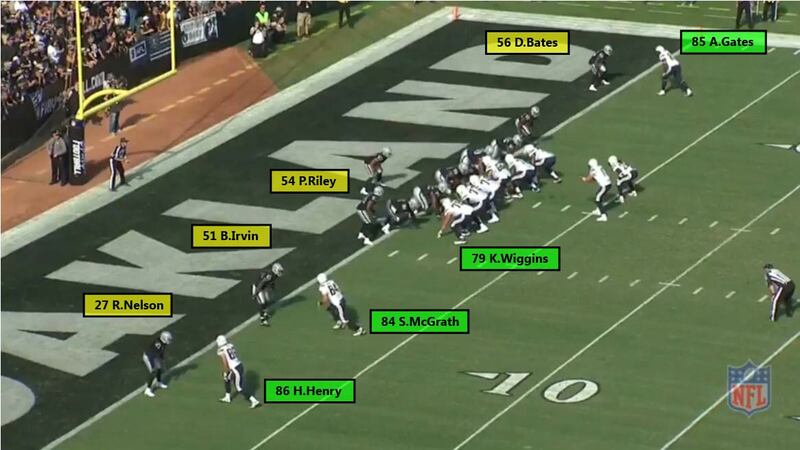 Notice that Bruce Irvin has great coverage on Gates. Rivers has just released the ball. The route combination is designed to draw Nelson; Rivers has read the coverage, is anticipating the deep 1-on-1, and is throwing it for the big play. Nelson gets stuck in No Man’s Land which leaves the defensive backfield empty. Benjamin gets a step on Smith and has the entire middle of the field to run into, but the throw by Rivers is to the outside. The throw allows Smith to get back into the play and to use his long arms to disrupt the pass. 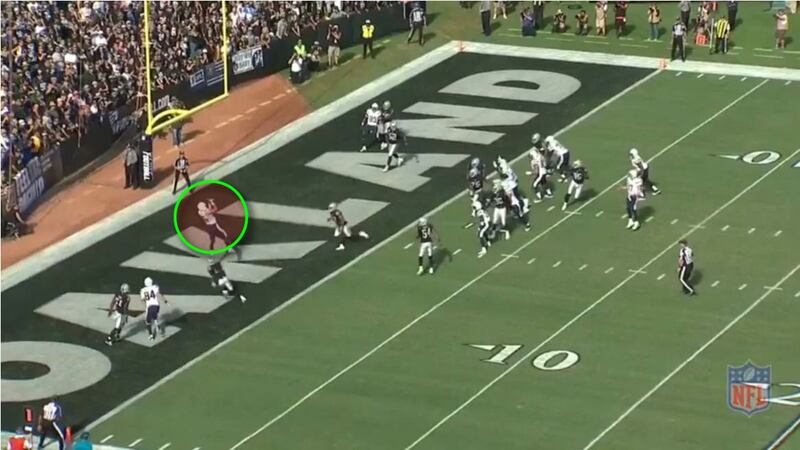 Sean Smith understood (or saw) that he did not have deep help from Nelson. Understanding that he was on an island meant that he had to defend the route more aggressively. 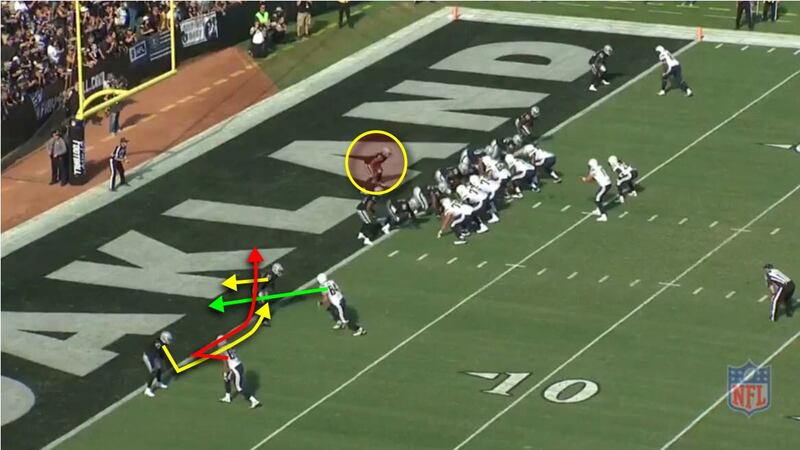 It’s a great play by Smith, but it’s also a slight misfire by the Chargers. The play worked; it drew Nelson down underneath and the Chargers got the matchup they wanted. In the first few games, we’ve seen Smith get burned by a speed receiver. In this case, a better throw may have gone for a touchdown. A team may get away once with Zero coverage, but repeating it is asking for trouble. This play may have revealed a potential weakness in this coverage. 2-10-OAK 29 (13:13) P.Rivers pass deep middle to Ty.Williams for 29 yards, TOUCHDOWN. 2nd Year WR Tyrell Williams (6’3″, 4.45s 40 yard) runs a deep post and splits two Raiders’ defenders (Amerson and Nelson). Rivers delivers the ball perfectly into the endzone for the easy 29 yard touchdown. TE #85 Antonio Gates lined up as the TE runs an out route at about 10 yard depth. LB Perry Riley drops in an underneath zone coverage with Gates. LCB David Amerson drops against Williams and protects against the outside deep route, playing as if assuming he has inside help. Reggie Nelson has to decide between the two routes. His rule is to pick up the TE if it is a vertical route, otherwise he doubles the WR. 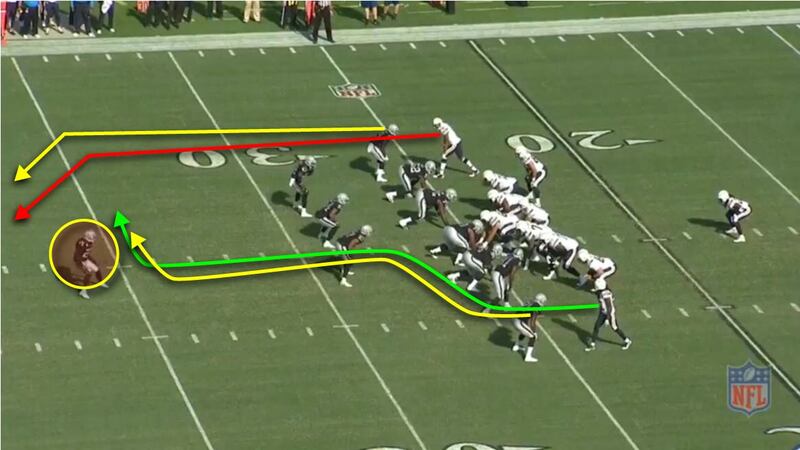 Gates’ route looks vertical until he breaks to the outside. 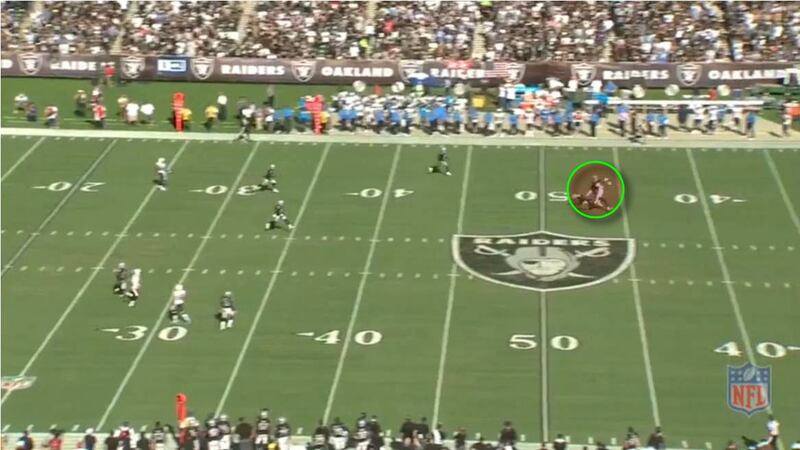 Reggie Nelson has already come up to cover Gates and he is now is a difficult position to cover Williams. He must flip his hips and reverse direction against a younger, faster player. Notice Amerson. He’s turned his hips to the outside, allowing him to run with Williams on a Go route, but making it very difficult to cover on an inside breaking route. He’s depending on Nelson on the inside. Unfortunately, Williams just runs away from Nelson and makes the easy TD catch. 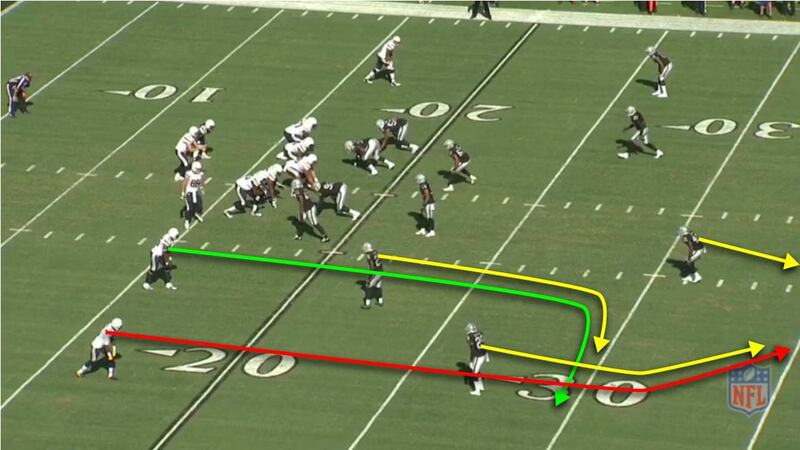 Again, the Chargers used the same route combination against the Raiders’ Quarters Coverage. 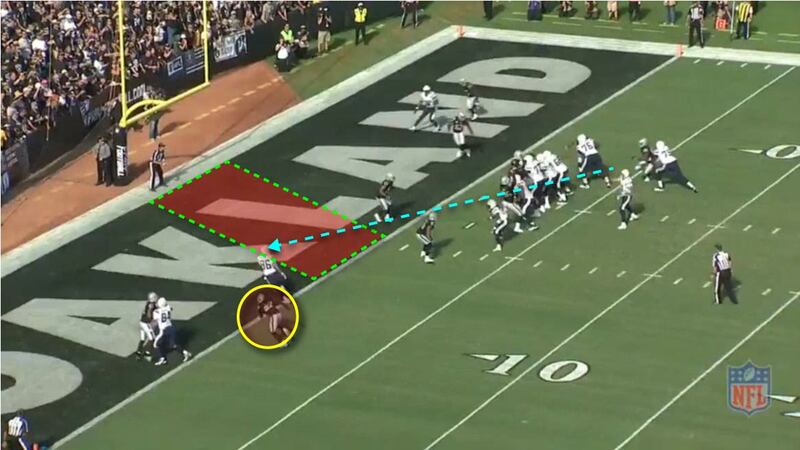 Again, they baited Reggie Nelson out of the deep field and got an open receiver. This time they converted for a touchdown. 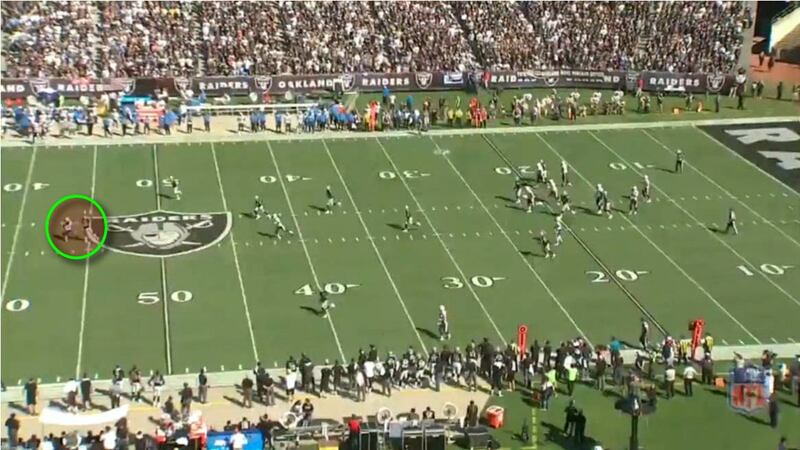 For a second time, the Raiders’ have shown a weakness in their coverage. 1-10-SD 20 (3:55) P.Rivers pass deep middle intended for T.Benjamin INTERCEPTED by S.Smith at OAK 41. S.Smith ran ob at SD 32 for 27 yards (T.Benjamin). Travis Benjamin again gets 1-on-1 v Sean Smith on the deep post. This time when Rivers makes the throw, Smith makes the interception. TE #86 Hunter Henry lined up as the TE runs an out route at about 12 yard depth. Benjamin runs the deep post on Sean Smith. Nelson has man coverage on Hunter Henry because it is vertical. 10+ yards is enough to clear the underneath LB coverage and be deemed a vertical route. 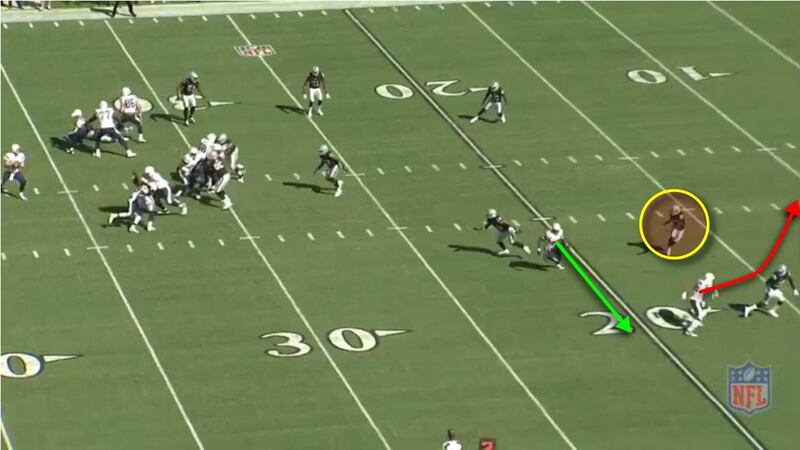 Rivers is throwing to the deep post as Nelson breaks to cover Henry, leaving Smith isolated. The deep middle is open and Sean Smith has to try to make up ground on Benjamin. Notice on the opposite side, Amerson and Karl Joseph have the WR doubled because there was no inside receiver. Benjamin has a step or so on Smith. Once again the ball is slightly off, this time it is underthrown by about 5 yards, allowing Smith to undercut and make the interception. Another great play by Sean Smith, partly because he understood that the safety was vacating and leaving him with true 1-on-1. 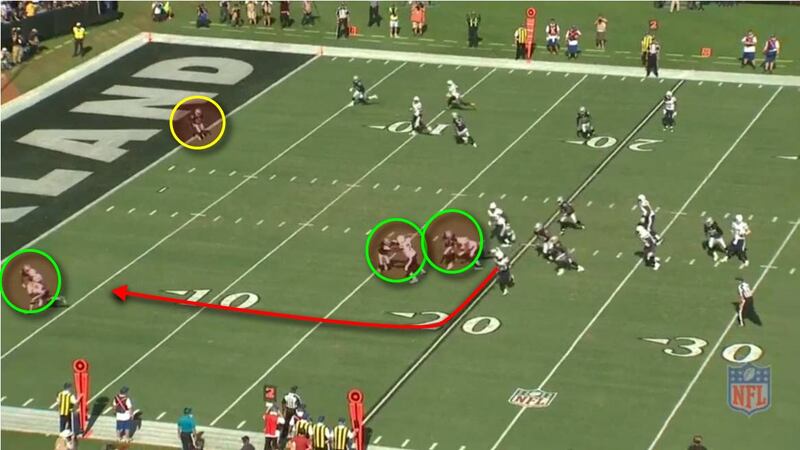 Again, we notice that the Post/Out route combination did as intended and exposed the deep middle of the Raiders’ secondary. The result was fantastic (interception and nice return by Smith), but it is increasingly concerning that the Chargers are so easily able to get the matchup they want. Opposing offenses will certainly take note and look to attack this coverage. 3-16-SD 18 (1:54) (Shotgun) P.Rivers pass deep middle intended for D.Inman INTERCEPTED by K.Joseph [B.Irvin] at OAK 35. K.Joseph to SD 44 for 21 yards (D.Inman). This time it’s Karl Joseph’s turn. Same out/post route combination. Rivers throws deep to Dontrelle Inman on the post, but Inman falls down and Joseph makes the interception. TE #85 Antonio Gates slot right runs an out route at about 11 yard depth. Same route combination as before, but this time the defense is in Cover 3 and so Karl does not have responsibilities on the inside receiver. Instead, he has deep middle third field responsibility. See that Gates’ out-cut has no effect on Karl Joseph, who is playing deep middle. 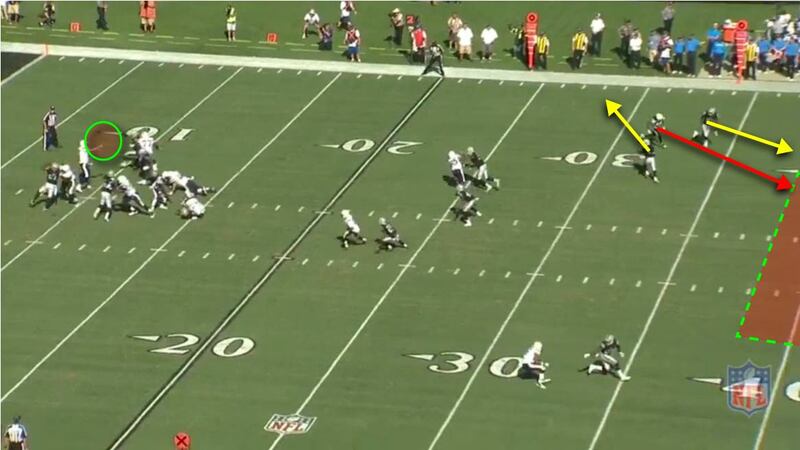 Amerson is playing very aggressively on Inman as Rivers is making the deep throw. 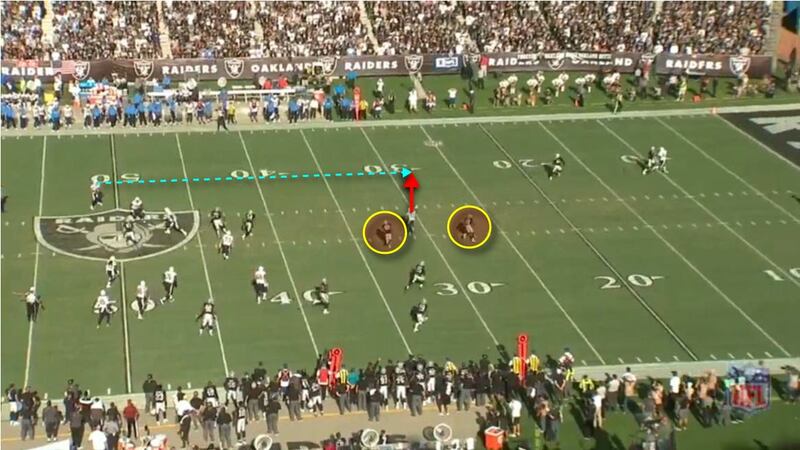 Read correct Cover 3 and was throwing Jump Ball to 6’3″ Inman on 5’10” Karl Joseph, similar to Amari Cooper’s big jump ball reception v Chargers in 2015. 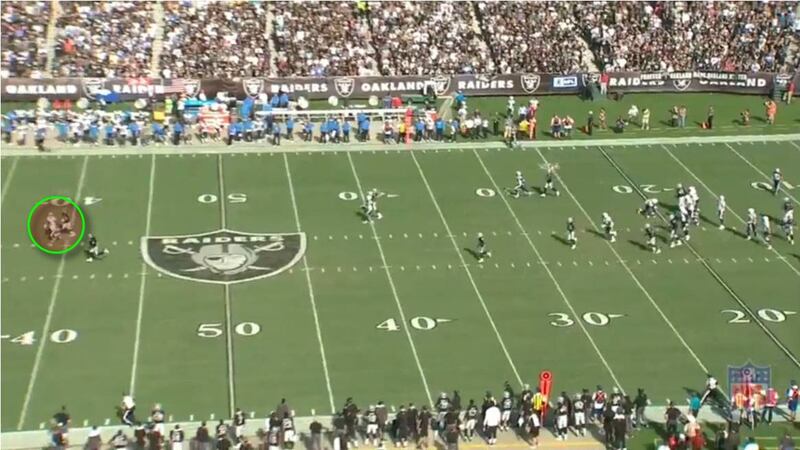 At first, it appears that this is an indication that Karl Joseph’s safety play was far better than Reggie Nelson’s. On this play, though, it’s more because of the coverage rather than the actual decision making of the safety. This does bring up a couple of important things. First, installing a new coverage (Quarters coverage/Cover 4 has not been part of the Raiders’ scheme so far this year) mid year is always challenging. It’s made especially so with 4 secondary players who are still unfamiliar with each other. It’s actually imrpessive that they played it as well as they did. Second, Quarters is an interesting coverage scheme and does have some advantages, but it may not be a very good fit for Reggie Nelson’s skillset. It’s clear that Nelson’s footspeed is not great. At 33 years old, we don’t expect it to be, but aging veteran safeties make up for it with great anticipation (eg., CWood). Having Nelson play in a foreign coverage scheme and one that is a tough fit, may end up causing more problems than it solves. Third, Quarters may end up being a nice match for Karl Joseph. Karl’s diverse skillset may be put to great use in a scheme like this. Part of the reason to implement it may have been to assess Karl’s play in it. Karl is the future and Ken Norton may have wanted to get a sense of how it fit him. 1-10-SD 25 (11:19) P.Rivers pass deep middle to Ty.Williams to OAK 25 for 50 yards (D.Amerson). Penalty on OAK-S.Smith, Defensive Holding, declined. 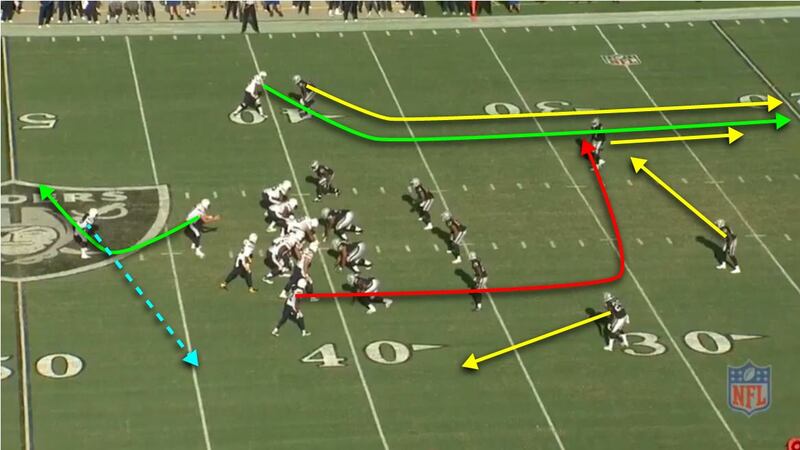 The Chargers’ routes combination is conceptually similar to what they ran earlier but here, it is to expose Reggie Nelson in Man-Free coverage. 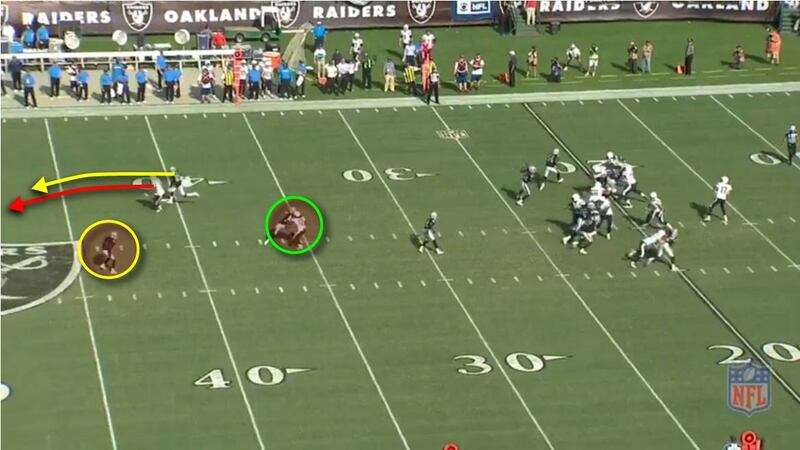 Man Coverage has Amerson on Williams and Sean Smith on Benjamin. The Crossing route runs right at Reggie Nelson and forces him to quickly decide where to double. Nelson doesn’t explicitly bite on Travis Benjamin’s route, but he does slow his feet. That was enough to let Williams get on top of him and then run right by. Nelson went from 3 yard cushion to 3 yards trail in a heartbeat and that resulted in the 50 yard gainer. 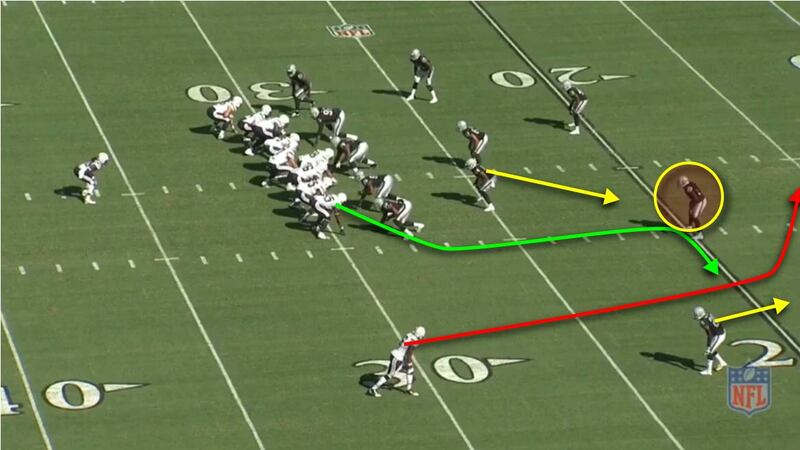 This is an interesting play because this is an equivalent concept to the first plays, but in Cover 1 v Cover 4. And once again, we see Reggie Nelson’s lack of speed being exposed in the deep secondary. It’s still too early to give up on Reggie Nelson. On thing to keep in mind is that he’s coming from playing under Mike Zimmer’ schemes 6 years (4 years under Zimmer and then two more under Zimmer’s assistant Paul Guenther). Moving from the reads and reactions in Zimmer’s schemes to those in Ken Norton’s scheme may be taking longer than we may have hoped. It’s hard to say whether these deep field problems are occuring because of Nelson’s footspeed or because his reaction and anticipation is compromised. All defensive backs are going to lose a step or so in their mid-30s, but the good (and great) ones are able to offset that with improved anticipation and game prep. Eg., Charles Woodson. Right now, it seems that Reggie is struggling with his recognition. Plays #1-5 showed the Big Play potential that the defense was showing. Mike McCoy and Philip Rivers were attacking the Raiders’ coverage in some specific ways and were often getting Reggie Nelson to get well out of position. Perhaps more concerning, though, is that there were a number of plays that looked like they were lifted from previous weeks. The Chargers scouts did a great job of looking at past Raiders’ film and grabbing some specific plays that were successful and added those to their weekly gameplan. And then at key points, they unleashed and the defense had not adjusted since. This is like the “Horn of Plenty”, a gift that keeps on giving or a Zombie rising from the dead to attack once again. Some fans may have not noticed, so here’s a closer look at those plays. 1-1-OAK 1 (10:14) (Shotgun) K.Wiggins reported in as eligible. P.Rivers pass short middle to H.Henry for 1 yard, TOUCHDOWN. Week 1 in New Orleans. Early in the game, Sean Payton decided to go for it on 4th-and-goal from the 1 yard line. The Saints lined up with 13 Personnel and the Raiders defensive confusion resulted in 10 men on the field and a relatively easy TD pass. This week, SD sets up with goalline package, 14 Personnel with an extra OT. This time the Raiders do have 11 men on the field with 1 Safety, 5 DL, 5 linebackers. The initial formation is a heavy, goalline run formation. 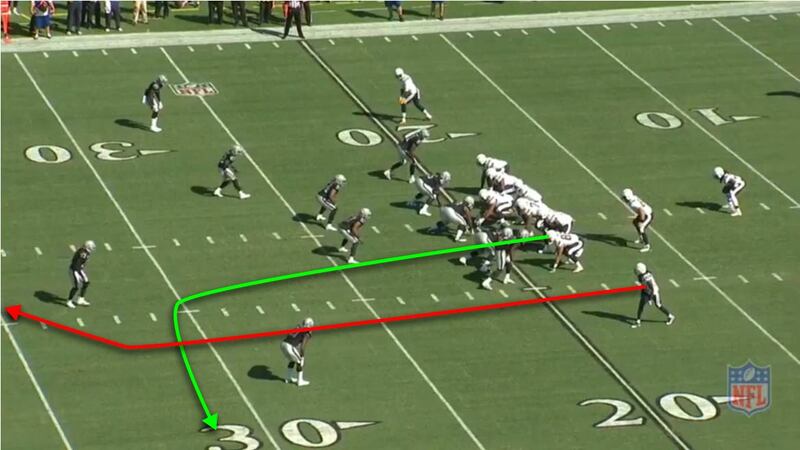 Then the Chargers take all the TEs and then line them up as WRs as if in 11 Personnel. This stretches the field horizontally and puts linebackers like Bruce Irvin and Darren Bates out in coverage. In this formation, rookie LB #57 Cory James is playing the FS position. On the outside, the TEs McGrath and Henry run a basic Pick Play against Bruce and Reggie. Perry Riley and Cory James are both in No Man’s Land, neither close enough to challenge Rivers nor with enough depth to close down passing windows. Reggie gets picked and is in trail position on Henry. There is no inside help and so it’s an easy read and throw. 1-2-OAK 2 (6:07) (Shotgun) D.Brees pass short left to T.Cadet for 2 yards, TOUCHDOWN. New Orleans put this on tape and SD cashed in on it. Now it’s up to Ken Norton to get it fixed. 2-7-OAK 18 (12:38) (Shotgun) P.Rivers pass short left to M.Gordon for 18 yards, TOUCHDOWN. The Chargers fake a WR screen to the right and then throw the screen to Melvin Gordon to the left. It leaves only Reggie Nelson and Cory James to make the play and two blockers out in front. Nice play design against a young defense that tends to jump on first action. Chargers show a WR screen to the right that draws 4+ defenders to that side and holds the other defenders so that blockers can get leverage. Meanwhile, the RB Melvin Gordon slips out to the opposite side which is empty. The DLine doesn’t recognize it at all and are drawn upfield. Reggie Nelson and Cory James are blocked and Melvin Gordon has an clear path to the endzone. The big key to this was the fake screen and how it sheared the defense. Nelson and James had to hold their ground and were slow to read the RB screen. 2-6-OAK 33 (8:01) D.Brees pass short left to M.Ingram to OAK 13 for 20 yards (J.Ward; M.Smith). There’s some misdirection that gets the Raiders’ defense to flow one way and then the screen pass goes to the empty opposite side. One good block and the RB is on his way. Young defenses are generally aggressive and susceptible to jumping on first action. This is a perfect example of that. 1-10-OAK 25 (10:53) M.Gordon right end pushed ob at OAK 1 for 24 yards (S.Smith). The TE and RT combine to neutralize Khalil Mack’s force and then Melvin Gordon gets to the outside. This was Melvin Gordon’s biggest run of the day. 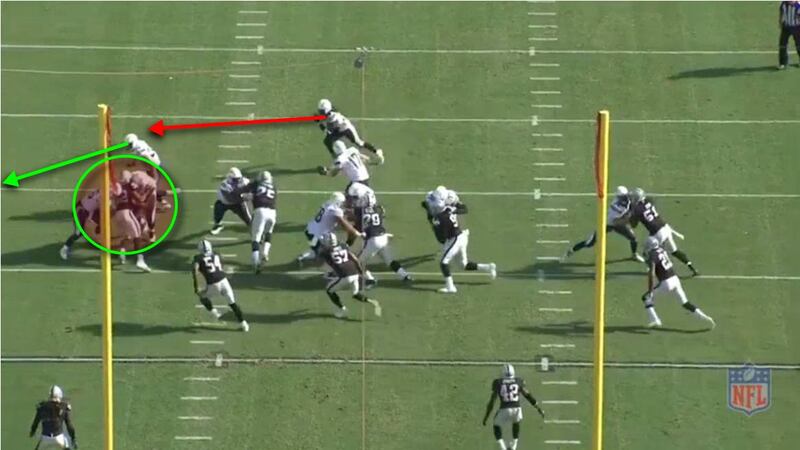 Aside from this play, the Raiders’ run defense did a pretty solid job on Gordon. TE #86 Hunter Henry motions from left to right. He sets up right in front of Khalil Mack. Henry and the RT Chris Hairston double Mack. With Mack sealed inside, the FB leads the play, and Melvin Gordon has a clear path to the outside. Notice #54 Perry Riley is in chase. Hunter Henry comes off his combo block and then seals Riley to the inside to spring this for the big yards. This is basically the same play design that Tennessee used repeatedly to gain the edge on Khalil Mack. 2-7-TEN 42 (13:48) D.Murray left end to OAK 41 for 17 yards (R.Nelson). This was definitely a scheme problem in Week 3 and here in Week 5, we are still seeing it gets exploited. Ken Norton and his staff definitely need to figure out how they want to address this. 1-10-OAK 40 (9:03) Lateral from #17 P.Rivers to #28 M.Gordon. Lateral from #28 M.Gordon back to #17 P.Rivers. (Shotgun) P.Rivers pass short left to T.Benjamin to OAK 17 for 23 yards (R.Nelson). The QB Bootleg has been a problem since the preseason game against Green Bay and SD used a clever variant of it by making it a Flea Flicker. Basically the same principles and it gave the Raiders’ defense the same problems. Clear out route by the backside WR. Rivers hands off to Gordon and then bootlegs away. When the defense flows, Gordon throws back to Rivers. 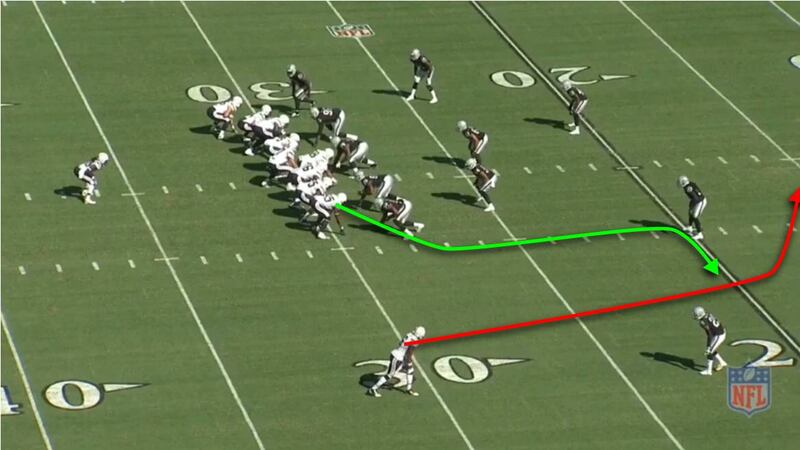 Travis Benjamin runs the over route and is wide open. 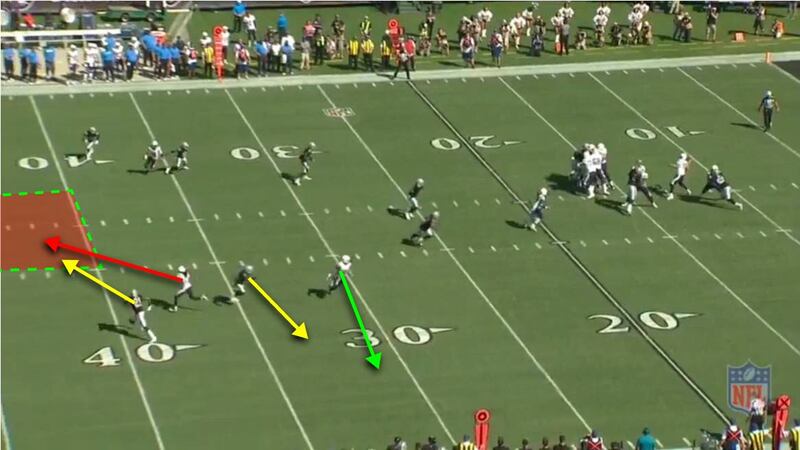 Karl recognizes and reads the play, but he can’t cover Travis Benjamin 1-on-1 in open space. On the play, Karl reacts to play the deep post as Benjamin runs the crosser. Perry Riley reacts late and tries to help underneath, but Benjamin v Riley is a total mismatch. The QB Boot is continuing to haunt this Raiders defense. Ken Norton Jr is still trying to find the right match of scheme and personnel to counter the opposing offenses. The primary coverages of Man-Free (Cover 1) and Cover 3 were having some problems so, he experimented with Quarters (Cover 4). As you may expected, installing a new coverage in-season was and up-and-down exercise. At times, it seemed that San Diego felt more comfortable attacking the coverage than the Raiders did in playing it, though some of the disguising may have led to a misread by Rivers that led to Karl Joseph’s interception. Keep an eye on this in the weeks to come. We’ll find out more about Norton’s vision of the coverage scheme in weeks to come. Reggie Nelson has struggled in adjusting to this defense. Most of the problem is recognition which is putting him in poor position and he doesn’t have the footspeed to make up for it. How much of this is the transition from the Bengals’ defense and how much is it just Father Time taking its toll on Nelson’s skills? That’s yet to be answered, but we still have not seen the best of Reggie Nelson. We still have not seen him really play and react naturally and full speed. In a sense, it’s like seeing a rookie trying to get up to speed, which is surprising for a 10-year veteran. It’s too early to give up on Reggie, but how long it will take Reggie to fully make the transition to Ken Norton’s defense is an important question. The answer to this may determine how far the Raiders are able to go this year. Keep an eye on Karl’s role. He’s a tremendous talent and his field awareness is very good. In college, he was mostly playing near the line of scrimmage where he could affect the game more, so he may need some time to be able to play more often in deep safety coverages, but we may start seeing the Coaching staff trust in Karl more and more. The Gifts that keep on giving : There are now 5 weeks of tape on the Raiders’ defense and there are some scheme problems that are clear as day. We had a great glimpse of an opposing offense scouting the Raiders and adding plays to their playbook that have worked so far this year. 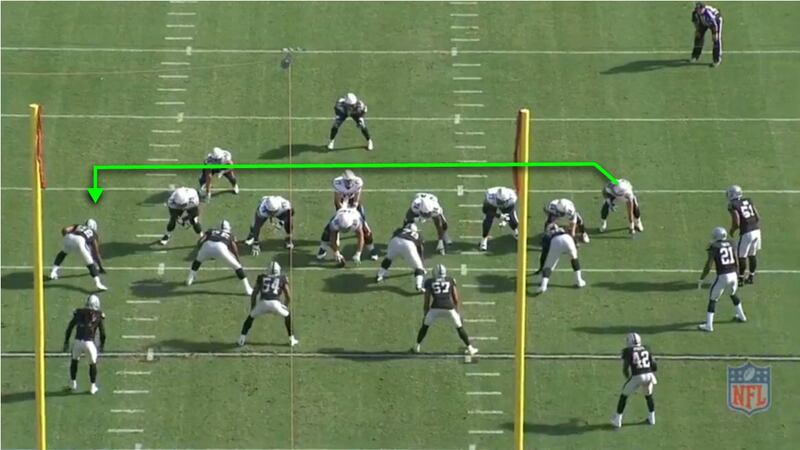 As long as the Raiders continue to have problems with these plays, opposing teams are going to run those plays at them. QB Boots, LBs split wide and defending Pick Plays, TE motion and double to seal Mack, Misdirection, RB screens etc. You cannot fix everything at once. There’s just too much and this is just too young a squad with very little history to fall back on. It’s like having a carpet that is just slightly larger than the floor; push down on one side and the other side lifts up. Push down on both and the middle bubbles up. It takes time to trim the edges and get the right fit. That’s of little solace to impatient fans, but what we can feel optimistic about is that there is visible evidence that overall the defense is improving. The defense did some very nice things this past week and there has been clear growth by some players (eg., Stacy McGee, Jihad Ward, Karl Joseph) and some scheme problems have been cleaned up. Notice that the run defense was actually very good and that the interior defensive line has not been blown off the line of scrimmage as it had been earlier this year. And while they gifted San Diego several big plays, they also made some big plays of their own : 2 sacks, 2 tackles for loss, 4 turnovers + 1 other fumble nearly recovered. It’s dangerous to build a defense dependent on just big plays and turnovers, but it is also exciting to have players that are capable of doing so. Sean Smith just tied his career high for interceptions in a season, Amerson has been very good defending, and Karl Joseph looks like a star in the making. The Linebackers are growing and so far have had a knack for punching the ball out. And the the Pass Rush is still finding its way. The Raiders’ Christmas Defense really came down to two things, Safety Play in the Coverage Scheme and Recurring Problem Plays. Most fans knew that the defensive backfield would take some time to gel and that the two new safeties would have to grow into the roles, but most thought that veteran Reggie Nelson would be close to “Plug and Play” while rookie Karl Joseph would be the one to be slowly weaned into the system. Right now, Ken Norton may be ready to increase Karl’s role and see how he fares. It’s bad enough to see the defense beaten for a big play; it’s much more frustrating to see that it was the same play that gouged the defense from a previous opponent. Recall last season around this time, the defense’s biggest problem was finding and stopping passes to the Tight Ends and Running Backs. The rest of the year, the defense did much better. 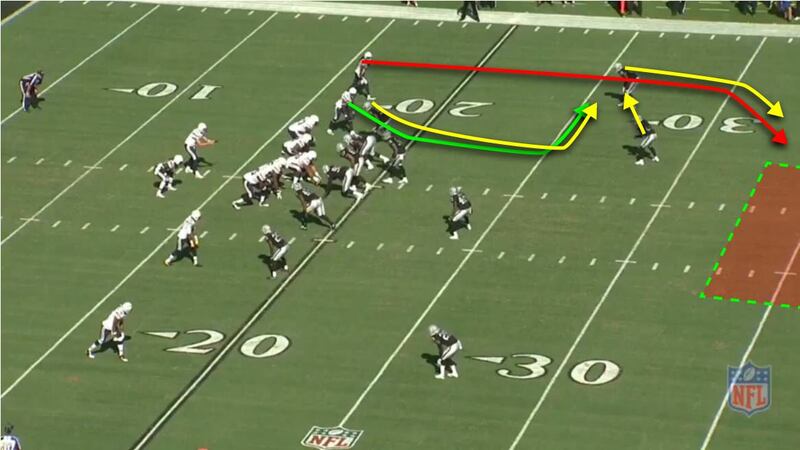 Similarly, expect Ken Norton to address these problem areas and start moving the defense forward. Each of these QBs (and their respective offenses) is certainly talented and capable of having a big game, but they are less likely to dissect the defense the way the previous QBs have. The defense will continue to come together and will have a chance to show their improvement in these games. Look for this unit to turn the corner at some point and to start to give us a look at what we have long term with the Raiders. Excellent work, Ted. Much appreciated. The is really concerning as a fan. Great analysis! You can’t keep getting beat with the same style of plays. This 100% on the defensive coaching staff! What coverages do you think the Raiders should be playing? or does this scheme fit the team and its needs to be taught better. Hey Gipsy. Thanks for the analysis. Sometimes as a fan its hard to figure out why the defense is struggling. A question from your article: what coverage scheme did Reggie Nelson play in Cincinnati? What coverage does he play best?